Because we all can't wait for the weekend! The week saw the Philippine Basketball Association (PBA) unveiling the Gilas Pilipinas 16-man pool for the upcoming 28th FIBA Asia Championships, with a handful of Pinoys shaking their heads on what they deem as sub-par lineup. And although the Calvin Abueva-led Manila North squad came up short in winning the 2015 FIBA 3x3 World Tour Manila Masters leg, aerial artist Rey Guevarra gave us something to cheer about by defending his slam dunk crown in the competition. Spicing up the week were Maja Salvador and Ella Cruz engaging in an unofficial dance-off; an introduction to (and even a selfie with) the newly-formed Star Magic Angels; and a look at the first-ever Victoria's Secret fashion show! We also brushed up on ways to annoy manong barbero, spot a high-maintenance girl, body type fashion, and tips on upgrading our favorite pulutan—really, these are all must-knows! For now though, you may want to hit pause and just chill. 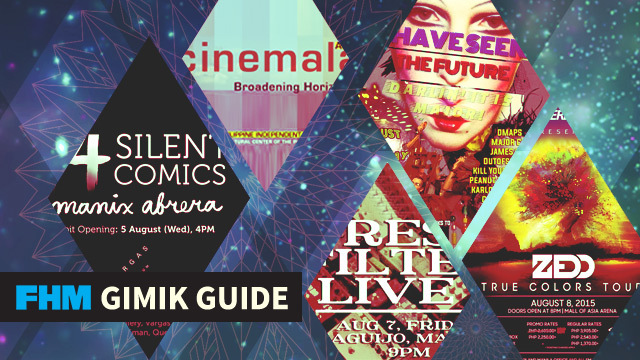 Read on for this week's edition of the FHM Gimik Guide! WHEN: August 7, 9 p.m.
WHAT'S UP: Just some of the best local indie musicians—previously only heard on Russ Davis' show on Jam 88.3—live! Featuring Hey It's Your Birthday, Tether, Paranoid City, We Are Imaginary, Japsuki and Cinema Explosion, this shindig promises to be a satisfyingly good one! WHAT'S UP: The Russian-German EDM icon returns to Philippine soil for the fourth time to once again drop the beats and pump up the Pinoy crowd. If you and your peers are planning to go clubbing this weekend, don't you want to be DJ-ed by only the best? WHAT'S UP: Only the country's premiere independent film festival on its 11th year, with special focus on short films this time around. Witness some of the best indie productions the land has to offer and get a chance to rub elbows with the actors themselves! Tickets priced at P150 each. For more information and the festival's complete schedule, click here. WHEN: August 8, doors open at 6 p.m.
WHAT'S UP: The hip resto-slash-bar-slash-gallery event celebrates its seventh year with an assortment of DJs—DMaps (Diego Mapa), Major Chi (Chie Castañeda), James Grr, and many more! See you there, artsy peeps! WHAT'S UP: The renowned komikero wall-mounts his latest materpieces for a larger audience to see. Hint: If you fancy Philippine mythology, this is definitely the place to be. For more information, contact Vargas Museum at (+632) 928-1927 (direct line), (+632) 981-8500 loc. 4024 (UP trunkline), (+632) 928-1925 (fax) or send an e-mail to vargasmuseum@gmail.com.